The Curious Brothers’ alien babies have grown up! 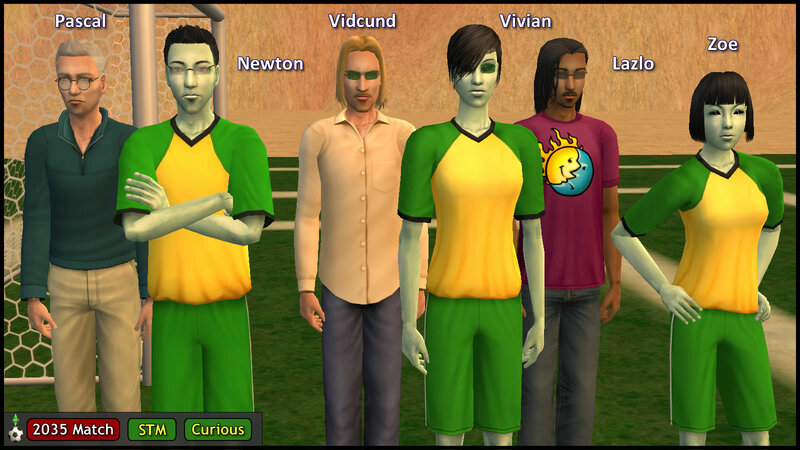 The “Curious Cousins”, Newton, Vivian and Zoe, are ready to be their fathers’ successors on and off the pitch. All three of them grew up together, under the watchful eyes of their respective father and two uncles. 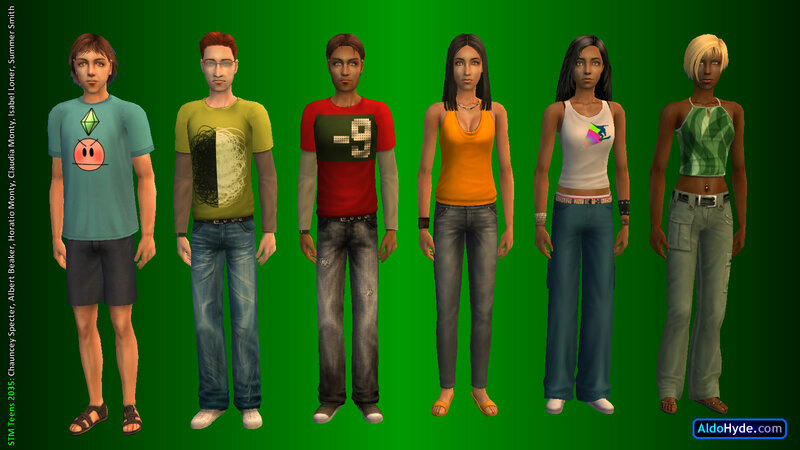 All 6 residents of the Curious Observatory share a passion for science, and pursue it as a career. Pascal has recently retired. Vidcund is close to becoming an Elder, but loves his work too much to even think of retirement. Lazlo is having fun guiding young Zoe in his own home lab. Newton is Pascal’s son, and the oldest of the cousins. He is a better scientist than sportsman, but can do an imperfect bicycle kick. Vivian is Vidcund’s daughter. She is one level lower in the science career than Newton. Vivian tends to be shy, and scared of high balls, but she excels at long-range accuracy. Zoe is Lazlo’s daughter, and the youngest in the family. She looks forward to work in an industrial lab, like her cousins, when she ages up. On the pitch, Zoe is a respectful player, but her passes usually end up over the sideline. PT9, the alien patriarch, may have passed on, but the Smiths are still a united family — now led by Jenny Smith, their benevolent matriarch. She is happy that Jill has recently gotten engaged, but hopes that her prospective in-laws will treat her well. Shortly after the 2015 match, Johnny Smith was scouted by Daniel Pleasant to join the amateur team FC Simley Town, which is stuck between the third-fourth division leagues. Johnny has been playing in Simley Town for his entire career, and has to remember that Daniel is not his manager for the STM-PVCS Match. Johnny married Ophelia right after his 20th birthday. Their daughter, Summer, resembles her mother more than her father. Summer is fit, but her tackles are poorly timed. Loki and Circe are pleased with their performance in the 2015 match, though they both were caught diving by the referee. Off the pitch, the Beakers were not caught for foul play in their home lab. As Nervous Subject escaped to his mother’s house before the 2015 match, the Beakers were stranded without a test subject. 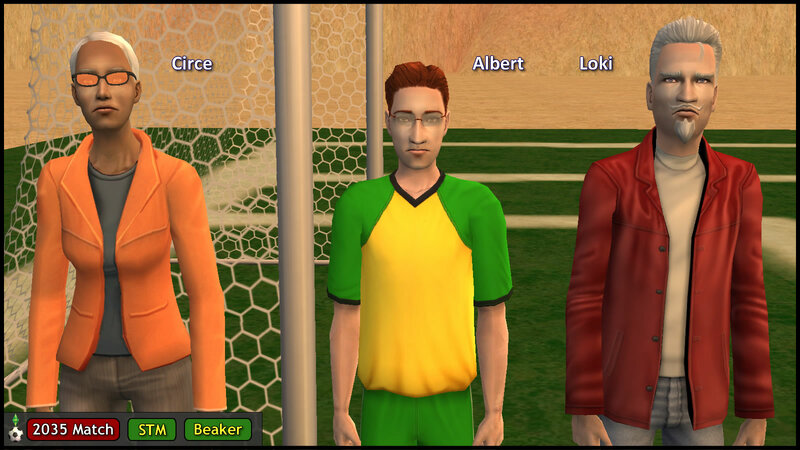 So Loki genetically engineered Atom and Ceres, but a subsequent experiment went wrong, causing the twins to be accidentally grown up and permanently lost into the future in Sims 3 Oasis Landing. Fortunately, Circe soon became pregnant, and their son, Albert, became their next test subject. After Ajay Loner recovered from his injury in the 2015 match, he married Erin Beaker. Their daughter, Isabel, is an attractive, energetic and kind young lady. She’s the only one in school to not have gotten in arguments with her first cousin Albert Beaker. 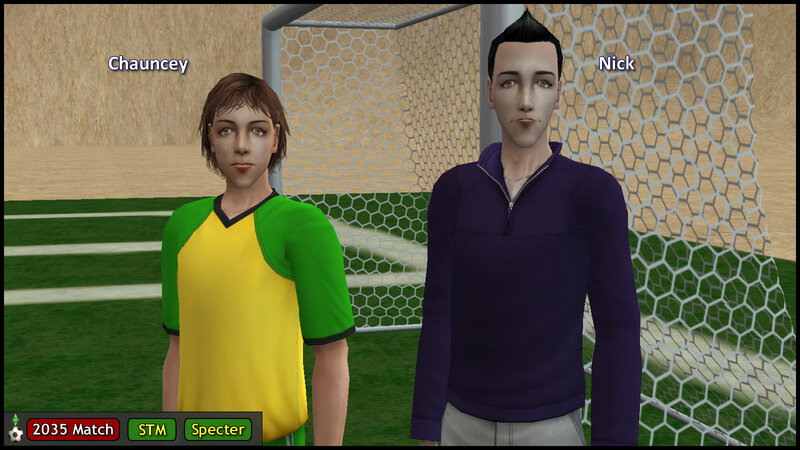 After the 2015 match, Nervous Subject legally changed his name to “Nick Specter”. He lived with his mother, Olive Specter at 13 Dead End Lane, and inherited the estate upon her death. Nick spent the night with a townie woman, but she decided to marry someone else. After giving birth to Chauncey, who clearly resembles Nick, the lady chose to give the baby to Nick, and was heard of no more. Chauncey grew up under mystical circumstances, and suffers from a strange, non-life-threatening condition that he inherited from Nick (which was a result of the Beaker experiments). Father and son live an isolated life, and they don’t even meet Ophelia and her family regularly. As a result, Chauncey barely knows his second cousin Summer Smith. On the pitch, Chauncey’s greatest asset is his speed. Will he repeat his father’s heroic antics? General Buzz Grunt earned the role of the Strangetown STM Manager with his formidable presence in goal during the 2015 match, especially with his last-minute save. Despite retiring from his lifelong military career, everyone around him still refers to him as the “General”. Old age has mellowed him slightly, but his military vibe is still intact. Three years after the 2015 match, Tank Grunt crashed Johnny Smith’s 20th birthday party. Johnny beat him up, and Tank swore he would take revenge, and break Johnny’s nose. So far, this has yet to happen, as Tank began to have other priorities in life — like joining the army and becoming corporal first class. Like his father, Tank is a fit military man, and a solid presence in midfield. When Buck Grunt became a teen, he was forced to lose weight ASAP. He hated the military drills, but enjoyed the goalkeeper training. 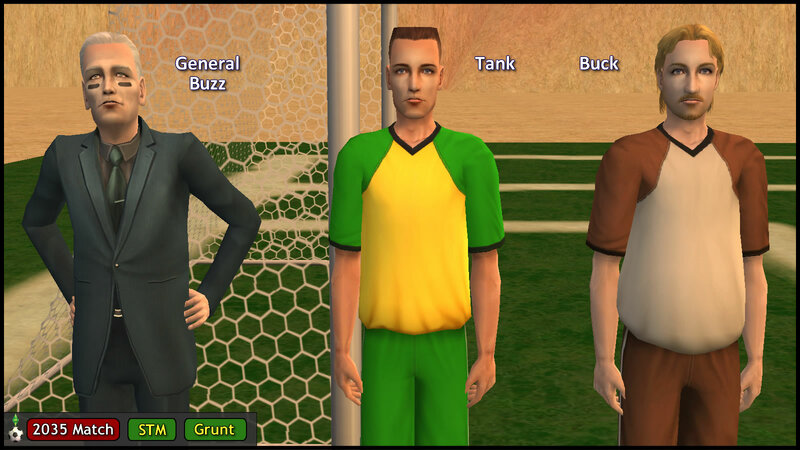 The General is pleased with Buck’s goalkeeping and free kick skills, but wishes he would pay more attention to building stamina and losing weight. Tank discovered that Buck was secretly engaged to Jill Smith. General Grunt was angry, but decides to tolerate Jill Smith because of her human skintone — though he wishes that none of his grandchildren would end up with the alien skintone. After his parents’ deaths, Antonio Monty is the new patriarch, who inherited the Monty Restaurant. He and his children are comfortable enough in their own home near the Monty Ranch, and do not feel the need to live in the ancestral home. 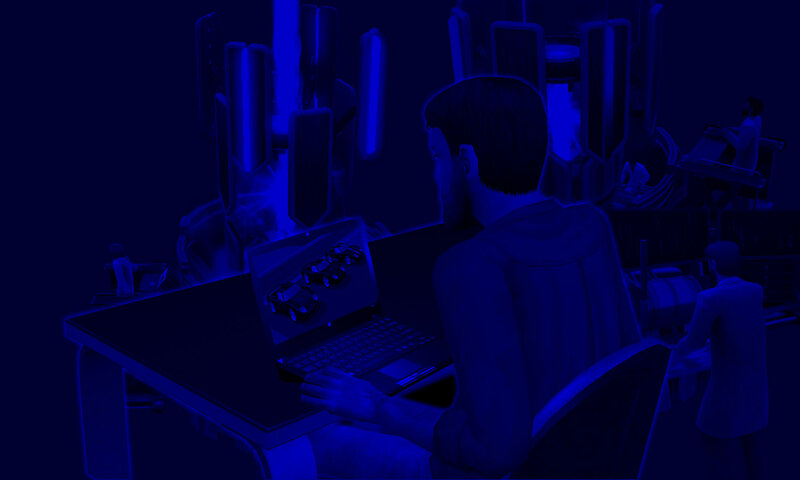 Under Antonio’s benevolent leadership, the Monty clan has become less intense in their Feud involvement, as they began to focus more on their careers instead. The Monty Restaurant is doing well, especially with both Bea(trice) and Ben(edick) following in Antonio’s culinary footsteps. 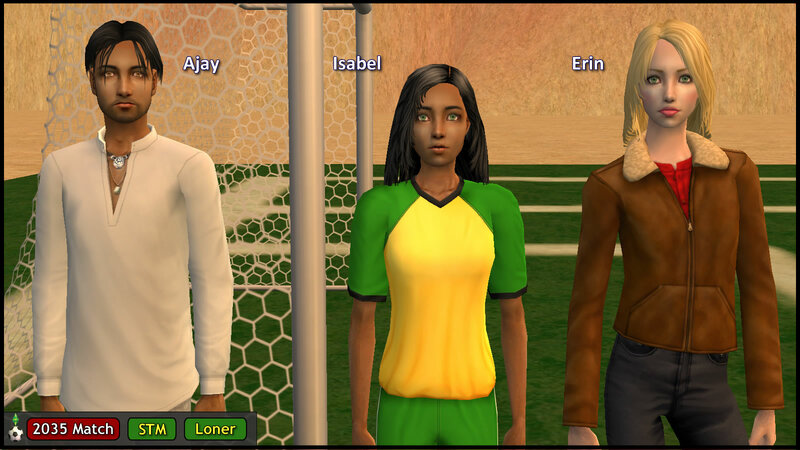 As for the role of the Veronaville STM Manager, Antonio decides to let Bianca and Kent decide among themselves, since they both played for the full 90 minutes, and may be better at football strategy than him. After all, Antonio and Kent now consider each other to be brothers, so Antonio is leaving this decision to his siblings. Bea Monty is an active and energetic young lady who spends the whole day on her feet, serving the customers. Her stamina is never an issue, but her excitability may compromise her pass/shot accuracy. Ben Monty tends to take his work too seriously. Since he became a teen, he had been diligent in improving his cooking skills in the family restaurant, rising from Assistant Chef to his current role as a Chef. Antonio knows the restaurant is in safe hands, as long as Ben is around to take over. On the pitch, will the ball be in safe hands with the serious Ben Monty in goal? Bo Monty, formerly known as Bottom Summerdream, is Ben’s wife. She is pregnant during the time of the match, so she chose to stay with her parents instead of making the trip to the desert. Before Ben left, she kissed both his hands. The Summerdreams don’t mind that Ben is playing on the opposite team from Puck/Hermia/Kelly. Since the 2015 match, Patrizio and Isabella became less strict with their descendants’ potential marriage partners, and will accept those with Capp ancestry, as long as they take the Monty surname. By the time Romeo and Juliette were old enough to marry, only Isabella was alive to allow the marriage. Juliette was disowned by the Capps. Her brother Tybalt considered her to be dead, and her grandfather Consort was so angry that he had a fatal heart attack. One year after Romeo and Juliette’s wedding, Claudia Monty was born. Claudia remembers her biological parents, and misses her “1st Mom” and “1st Dad” very much. She was adopted by her grandaunt Bianca and granduncle Kent, whom she now considers her “2nd Mom” and “2nd Dad”. 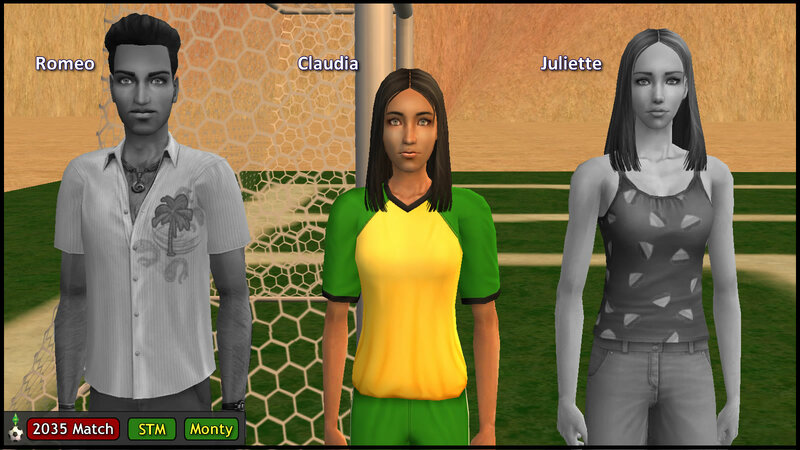 As a teen, Claudia is a skillful footballer and playful young lady, with an impetuous streak. Among the Montys, Mercutio Monty is the most involved in the Feud. The main reason is his hot temper, since he tends to react violently when provoked. Other than that, Mercutio is laid back and fraternal. Running a farm and marrying Miranda has made him more sensible and responsible. Miranda was disowned by her mother, Goneril, for marrying a Monty. But her life with Mercutio is simple and happy, so she does not regret being a Capp turncoat. She gets upset when it is obvious that Mercutio had been in a fight with Tybalt, but she always forgives Mercutio because he is a good and faithful husband. The day of the match is close to Miranda’s due date. She plans to check herself into the hospital, and watch the entire match on TV. What happened to Miranda’s sister, (Desde)mona Capp? In the 2015 Match, Kent was the first Capp to break the taboos, by openly defecting to Team STM, putting up a spectacular display of teamwork, and impressing Pat Monty enough to become his son-in-law. Kent and Bianca were married by the end of the year. Since then, the Capp family refers to him contemptuously by his new full name, Kent Monty, treating him as if he never had Capp origins. Not that Kent minds, as they could have called him anything else much worse. His sister, Regan, who grew up playing video games and football with him. Those were the days when Kent wore the Capp jersey, and they were happy as siblings. Kent could never fit with with the other Capps, but was always comfortable with Regan. If Regan Capp is hiding a secret from her menfolk, Kent Monty decides to come clean to Bianca. In the early days of their marriage, he told her upfront that he was secretly communicating with Regan. Bianca chooses to tolerate this, because she is close to her brother Antonio, and because she trusts Kent. Their marriage began well, having passed this early test. Regan is the only one else who knows that Bianca knows. Antonio took a whole year to get used to his new brother-in-law. But as time passed, he started to treat Kent like his brother, and this kind gesture is reciprocated, much to Bianca’s delight. Bianca works at the local library as a researcher. Kent is a scientist who occasionally does collaborative projects with the Curious Brothers of Strangetown. In this Alternate Universe, neither Bianca’s library nor Kent’s lab are affiliated with Hyde Dynamic. 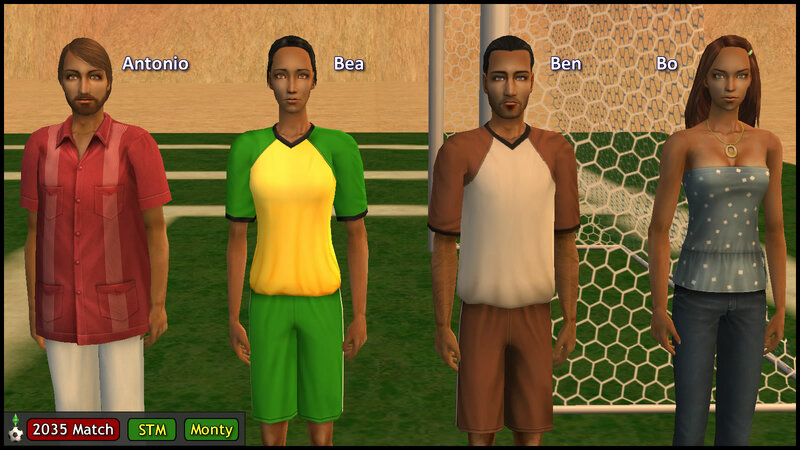 Bianca and Kent have a son, Horatio Monty, an intelligent and warm-hearted young man. He was soon joined by his first cousin once removed, Claudia Monty, who is treated as his younger sister. They get along well, apart from occasional fights over the living room computer. Horatio is an avid gamer who uses the online tag “DrRatio”. As Claudia just turned 13, Horatio helped her set up a gaming account too, but she keeps changing her username. Horatio warns her to decide on one account soon, before she gets banned for sockpuppetry. When the siblings went out, they were occasionally harassed by Goneril and Albany Capp, whose violence was more psychological than physical in nature. Claudia’s late biological parents were often mentioned in an unkind manner, frequently leaving the young girl in tears. As for the young boy, the bitter Capp couple sought to manipulate and confuse him, hoping to turn him against Kent. Horatio always reported these incidents to his parents. On the pitch, Horatio is a fast and respectful player. Hopefully, he won’t disgrace Kent, who is the Veronaville STM Manager.